Your hosts Michael and Tiffany talk about Walt Disney World. We discuss news, history, vacations, and stories from the most magical place on earth! So, take a break from life and go back to the World for a few minutes. On this weeks episode we go over 20 secrets about Walt Disney World that you might not have known that aren't aren't really secrets. In news, Disney talks more details about the Skyliners and we find out more about the new lounge coming to The Grand Floridian which is inspired by Beauty and the Beast! We also have a special guest that may make some appearances throughout the show! Episode 34 - News about Epcot, Magic Kingdom and More! Epcot is adding another restaurant to the France Pavilion that focuses on crepes! Rafiki's Planet watch is coming back in the summer and Magic Kingdom's "Walk around the World" bricks are being torn out! We talk about this and more on this week's episode! Disney has announced the opening dates for Star Wars Land(Star Wars: Galaxy's Edge) and its much sooner than anyone thought! A North Carolina restaurant owner might be the best employer alive! She closed her restaurant for a week to take her employees to Walt Disney World. Disney Plus(+) is getting more enticing every time news comes out about it. Star Wars Land details are really starting to come out full force as the media is starting to get a glimpse at what Disney has been doing behind closed doors! I am more excited about this than I thought I would be. Galaxy's Edge is going to be a fantastic experience, even if you are not the biggest fan of Star Wars. Stay tuned for more information as we get closer to opening. Epcot's main entrance is finally getting a major update that is sure to please and the Wonders of Life Pavilion is finally getting itself remade into something interactive. Should you take your child on a Disney Cruise? Listen for reasons why you should. The best time to go to Disney World has been changing over the years. We look at Bob and the Showgram's take on the best time to go according to undercover tourist. Also in this episode, Disney World merchandise and Valentine's Day event at The Boardwalk! The World of Dreams Tour is now available to all guests will to pay $12,000. A woman is suing Disney for another guest running her over with a scooter and a man hopes out of Space Mountain while its moving in Disneyland. Episode 28 - Is a Deluxe Resort Worth It? Is a deluxe resort worth it? Disney's Riviera Resort is now taking reservations for late 2019. A new restaurant is coming to Disney Springs West Side and Magic Kingdom has candied bacon on a stick! *Sorry for the very quiet audio in the beginning. Don't worry it gets better. A short episode this week. A giraffe is born at Disney's Animal Kingdom for all to see and it's already time to start planning for your Halloween Party trip! Want to know what the worst mistake you can make on a Disney vacation. If you have kids you will want to listen to this one! We also talk about Mickey ice cream, Illuminations dinner and Disney buying more land. Happy New Year! and welcome back to another episode. Disney has announce a few promotions to entice people to visit the World. Business Insider responds (I don't think intentionally) with an article about how Disney is pricing out the middle class. A mystery in Epcot as an animatronic's clothing has been stolen along with hands! Mary Poppins is an untouchable classic, but does Mary Poppins Returns come close? Find out our take on the new Mary Poppins and listen to some of the news of the week. Merry Christmas! It's no secret that Walt Disney World has Christmas decorations everywhere. In this episode we dive into some fun facts from Disney that prove just how serious they take their decorations. In the news, Beauty and the Beast is getting a pretty big are in Tokyo Disney. Start saving your pennies! The Candlelight Processional at Walt Disney World is one of those holiday traditions that has endured decades and will last decades more. Nothing gets you in the spirit like the Processional. Some big names in Hollywood and hundreds if not thousands of choirs have tken part. So, this week we take a look at its history and how it came to Walt Disney World. Wait until the end and enjoy a snippet of the performance! A guest driving a scooter knocks a door off one of the monorails. Disney World is going to have 9 automated PhotoPass locations starting November 26th and man gets banned from the parks and Disney property for life! What is your list of most overrated attractions in WDW? On this weeks episode we go over thetravel.com's list and boy do we disagree! As always we talk news. This week moms are going bad in WDW! Short episode this week. We go over the news of the week. Whirlpool becomes and official sponsor, resort fees are harder to get than Disney thought, Hollywood Studios loses one of its entrances and Mickey turns 90! Episode 18 - Disney Halloween Costume Ideas! and news. Join us this week as we go over our GREAT ideas for Disney themed Halloween costumes. Sticking with the Halloweens spirit we talk about the recent news about people spreading ashes in the Disney World parks. We are getting closer to Halloween so that means more Mickey's Not So Scary Halloween Party talk! This episode we reveal our top 5 parade floats during the Boo to You Parade. Disney announces another hotel being built and a man accidentally brings a gun to Walt Disney World! Oops!! Many attractions are going to be closed for refurbishment in the coming new year. Spaceship Earth is going to be down for a loooong time. Disney ruined a man's proposal and got him arrested, now he is suing. We answer some random internet questions about Walt Disney World on this weeks episode! On this episode of The WDW Chronicle Podcast Michael and Tiffany discuss the news from the past week! Disney World has raised their snack and beverage prices again, but this time its no small increase! The Edison is having a Halloween Soiree. Come have a listen! Sorry for the 2 week absence for the past two weeks, but your hosts Michael and Tiffany are back this week to talk about some of the big news that has been coming out recently. Illuminations ending, a new way to purchase your park tickets and more Candlelight Processional narrators have been announced! Episode 13 - The Best Lounge in Disney World! 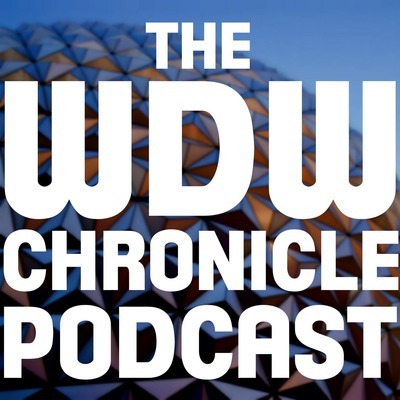 On this weeks episode of The WDW Chronicle Chronicle Podcast, your hosts Michael and Tiffany discuss what they think is the best lounge in Disney World as well as cover some news from the week. Give it a listen and please subscribe and review! On this weeks episode of the WDW Chronicle Podcast your hosts Michael and Tiffany share news of the week. After the news they discuss how young is too young for the parks. Here is a little hint; we disagree! Welcome to this weeks episode of The WDW Chronicle Podcast! On this weeks episode, your hosts Michael and Tiffany talk about a few news items and go over Mickey's Not So Scary Halloween Party. The party has many new things to offer this year! Join your hosts Michael and Tiffany as they talk about their favorite attractions in Walt Disney World! From the very popular to the not so popular. We also talk about a few newsworthy items from the past week. Join your hosts Michael and Tiffany as they talk about the Christopher Robin Movie and the nostalgia is brings! Episode 8 - All about food updates! Join your hosts Michael and Tiffany while they talk about the new food arrivals at Walt Disney World including edible cookie dough! Sorry we have been gone a few weeks! Welcome to this weeks episode of The WDW Chronicle Podcast! On this episode Michael and Tiffany go over some news from the week and try to answer why they love Disney. Welcome to the 6th episode of The WDW Chronicle Podcast. In this episode your hosts Michael and Tiffany talk this weeks news and what we consider our favorite modes of transportation on Walt Disney World property. Welcome to The WDW Chronicle Podcast. On this weeks episode, your hosts Michael and Tiffany talk about this weeks news. From a monorail missing its windows to the top 8 restaurants at Disney World as written by House Beautiful. Welcome to the 4th episode of The WDW Chronicle Podcast! On this episode, your hosts Michael and Tiffany focus on the news of the week. Cast Members best things to do in the parks, stroller parking, inclusive restrooms and a Lego Spaceship Earth. Articles can be found below! http://www.businessinsider.com/disney-cast-members-favorite-rides-2018-6#the-haunted-mansion-is-one-of-the-parks-spookiest-spots-10 https://www.orlandoweekly.com/Blogs/archives/2018/06/04/parking-a-stroller-at-disney-world-just-got-a-bit-more-complicated http://www.foxnews.com/travel/2018/06/05/disney-world-slammed-by-parents-disabled-child-for-disgraceful-lack-changing-facilities.html https://ideas.lego.com/projects/a6fbfa6c-49b9-4f7c-8530-4b1c46ca0ad4 Check us out at wdwchronicle.com! Welcome to the third episode of The WDW Chronicle Podcast! On this weeks episode we talk about the news of the week and vacation tips when vacationing with family! Don't forget to check us out at wdwchronicle.com and on facebook at The WDW Chronicle. We hope you enjoy the show! This is the second episode of The WDW Chronicle Podcast. On this episode, your hosts Michael and Tiffany discuss Maleficent catching fire, alcohol in Magic Kingdom, royal wedding merchandise and meeting Marty Sklar. Welcome to the first episode of The WDW Chronicle Podcast! Hosts Michael and Tiffany explain their origin stories in becoming die-hard Disney fans and what future shows will be about.